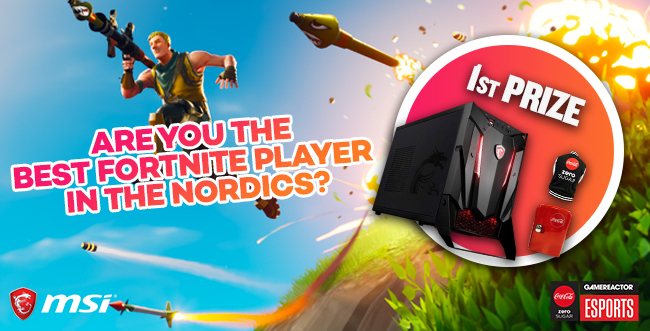 ARE YOU THE BEST FORTNITE PLAYER IN THE NORDICS? Join our Fortnite Battle Royale Nordic Championship and find out if you are the best Fortnite player in the Nordics. All you have to do is join a Solo Queue (Solo mode) on PC / PS4 / Xbox One / Switch, and eliminate other players. The goal is to get the highest amount of eliminations in a game. If you love to shoot people and want to win great prizes, join us below. You have the opportunity to win great prizes, if you’re the best Fortnite player in the Nordics. Note: Any score that cannot be verified by the uploaded screenshot according to the rules will be removed from the championship without warning. Fill in your personal information in the form below and submit. Once you have entered the championship, open the game, go to Solo (Solo mode), and start eliminating players. You can try to improve your score as many times as you like. Fill in your personal information in the form below and submit. You will receive an email with a link to your personal score page. The leaderboard on this page will be updated automatically as you enter your score. Where: Play a Solo game (Solo mode) and take a screenshot of your scoreboard, with your Gamertag shown. Put in your eliminations on the leaderboard and upload the screenshot. Lack of proof makes the entry/result invalid. Elegibility: You have to live in, and be a legal citizen in a Nordic Country (Norway, Sweden, Denmark, Finland) and must be at least 16 years old.